This is the first year that I’ve worked outside the home in quite some time. For the past 4 years I’ve been able to basically ignore the weather and turn up the heat if I got cold! That doesn’t work so well now, when I have to park far away and wander around campus in the cold. In addition, my studio has moved this semester to be right across from the outside doors, and it is absolutely freezing in there most of the time. In February, I’m going out of the country with the university. We don’t exactly have the most frigid weather here (it gets cold, but we rarely have lingering snows or more than a few days in a row below freezing) but I have a suspicion that I’m going to freeze. The last time I went away for this long was two years ago, when we spent 2 weeks of March in Italy. I was not expecting how cold it was, especially in the churches and cathedrals where we performed. There’s nothing like seeing your breath while you sing! 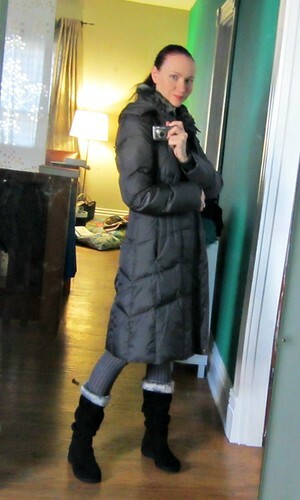 I’m surprised by how much I like it – I never thought I would own a puffer coat, but it’s so lovely and warm! It has a hood, and the collar is lined with soft faux chinchilla fur, which is lovely. I didn’t like the scratchy fur that a lot of coats had. It’s much more stylish than the puffy coats of my childhood! And since it’s the end of season, I got this coat for 1/3 price! I also needed to find warm boots. I have been finding that my toes go numb inside my boots after a walk. I have a really hard time buying boots because I have skinny (12.5″) calves. 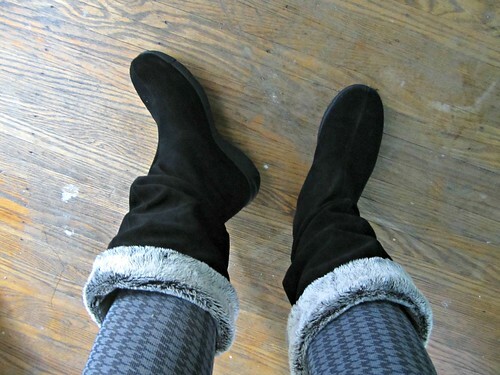 Most boots look like rainboots on me, and I wanted warm boots to fit snugly so the wind can’t get in! Yes, that’s my Butterick 5523 dress. I still love it and wear it constantly! 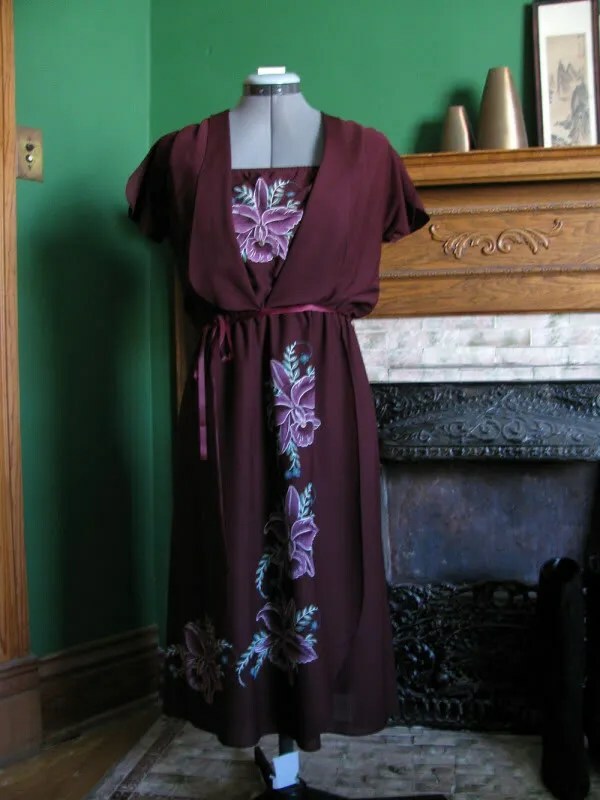 I’m planning to make a few knit tunics/dresses before I go. I will have a post about that soon! I’ve also finished my new vogue dress, and it is fabulous. I will take photos tomorrow on my husband’s day off and write about it then. Sorry for the radioactive photo! 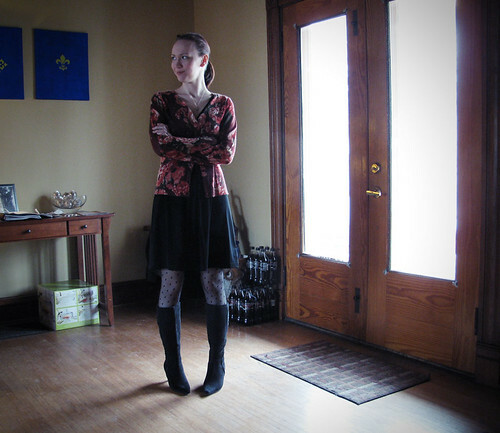 I have a lot of trouble getting properly exposed photos when I’m wearing a dark outfit. I am really, really pale, and all my childhood photo albums are filled with photos of me glowing in the dark. Still, this was the best photo of the dress (there is another on flickr, but while I look ok (only slightly radioactive) the dress is rather dark. I get better photos outside, but I don’t have much of a backyard, and I live in a neighborhood with tons of foot traffic – sometimes I don’t feel like being stared at! This dress is one of my favorite thrift store finds. I rarely find decent vintage, but I do have a few stores that I visit which I think the pickers avoid. This dress doesn’t have a lot of hanger appeal, but I love it! 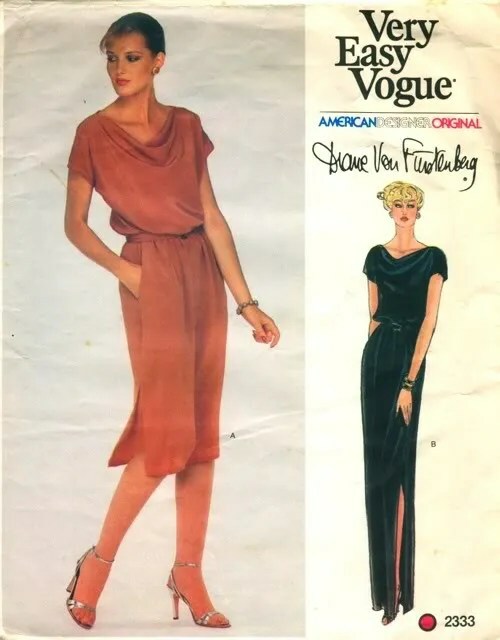 I’m finding that dresses of this era (late 1970s?) suit me. 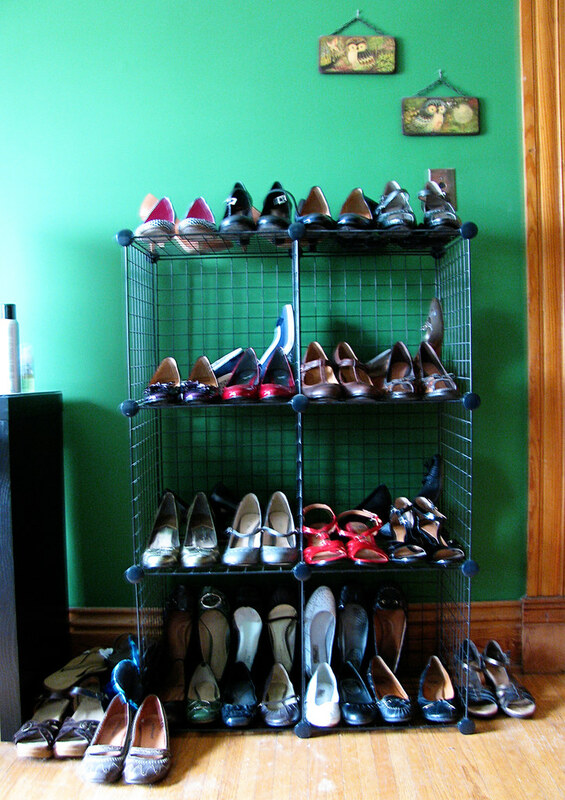 On to the topic of the day: Storing (and sorting) shoes. I store all my boots with rolled up magazines inside, so that they don’t fall over and crease. And yes, that is a t-ball bat (you know, in case we hae any really tiny burglars!) 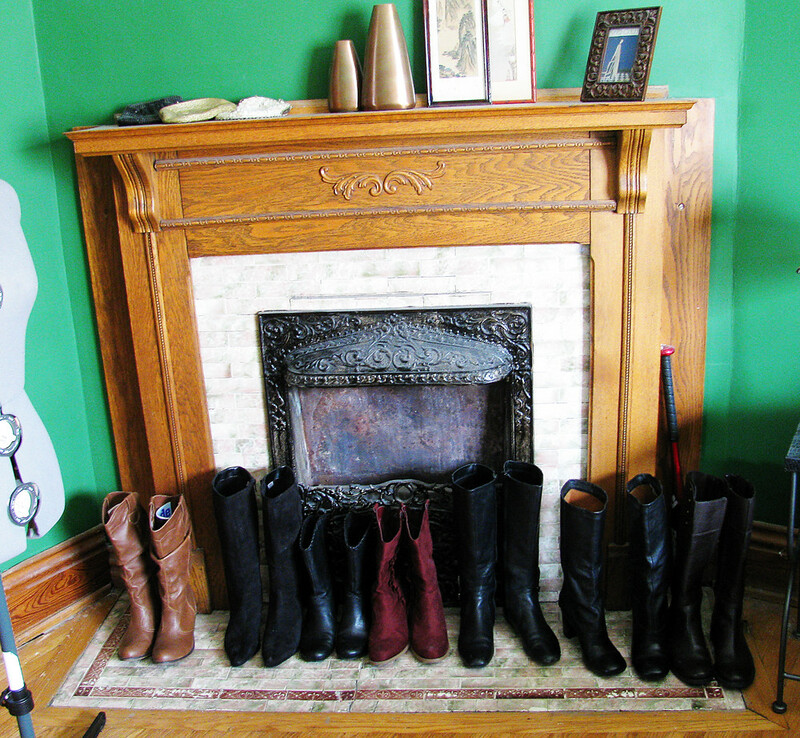 I have a lot of boots, because I wear them most of the time in the winter. I wear the other shoes in the spring, summer, and fall. I have very few pairs of sandals (and I had to send back the Seychelles I just got from 6pm – they were too big!) I don’t wear sandals often… they just don’t go with my wardrobe very well. Going through the shoes (and getting rid of a bunch) helped me to see where the holes are in my collection. I do not, for instance, need any more black shoes (especially because I don’t wear them often in warm weather – I don’t care for the contrast.) I would like a pair of casual oxford type shoes – I am seeing them worn with dresses quite often, and I think it would be nice to have a different type of flat. I’m thinking of the Caley by Bass. But, they are from last season and seem to be sold out everywhere! I can find the brown/black color, but it’s the blue with red stitching that I really love. I might go ahead and buy the other color while I still can. Wouldn’t they be lovely with a retro dress? Again, they aren’t too high cut, which keeps them from looking too mannish to me. Lately I’ve been using Pinterest to keep track of the pretty shoes I find, most of which I won’t buy. If anyone is interested, the shoe pinboard is here. I might also get a new pair of sandals for summer, flat ones to wear with maxi dresses, but I have yet to find any that I like. I don’t know why Sandals don’t appeal to me! A new pair of Mary janes is definitely in the cards, as my pair of black Mary janes is entirely too uncomfortable for wearing without tights. I’m also obsessing a bit about what shoes to take on my trip to Italy (in 2 weeks!) But… once I get my packing wardrobe planned that will be a separate post. I have yet to decide whether I’m doing me-made-march or not. I will be in Italy for half the month, but perhaps wearing my handmade stuff might force me to pack a bit lighter! So… here we go! First, for reference, above is a photo of my current glasses. This pair is at least 10 years old. I would like a larger lens (my eyes are pretty bad, so I can’t see anything at all around the edges of these, and even the edges distort a bit.) I don’t care for the oval shape anymore, and I think the narrowness of the shape doesn’t suit me. I have a pretty big head, and wide, high cheekbones – I think these are too delicate! 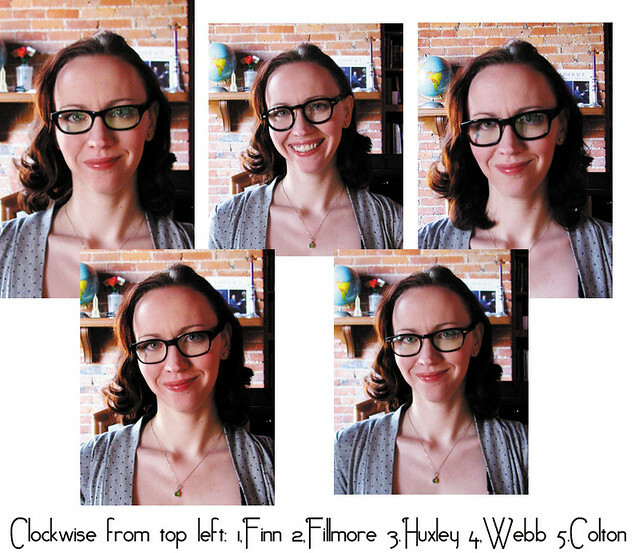 And… I like a little bit of a nerdy style – thus the frames I’ve picked to try on! Here are the five pairs I got to try on. I’m thinking I like the Coltons (bottom left.) They’re nice and big, but not overwhelming like the Huxleys. The webbs are similar, but I think I like the Colton more. The Finns are also nice, but they are a bit smaller than I’m really looking for. The Fillmores are hilariously terrible on me – and weirdly, though they are the largest frames, they are too narrow for my face! I’m so bad at making these sorts of calls! So… I’ll open it up to the internet. Which one do you think suits me the most? 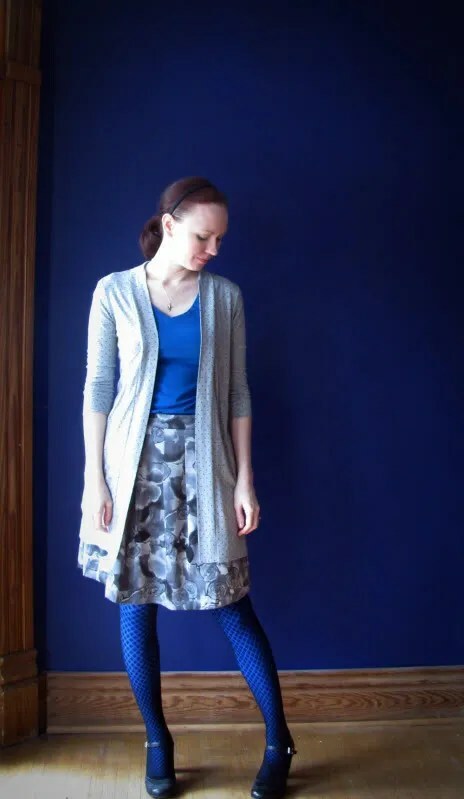 One question I get asked a lot is “How can you stand to wear skirts in the winter?” There are a number of tricks, but the best one I have is to wear really thick tights. I have several pairs of sweater tights, which I love, but they don’t really come in bright colors. So when I want some color, I start layering my tights! 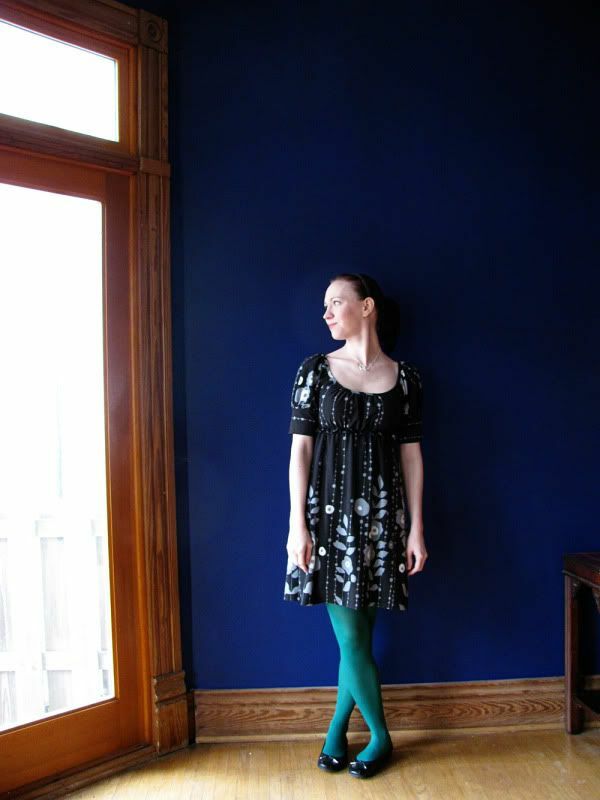 If you have a brightly colored pair that aren’t quite opaque, try layering a pair of black tights underneath. If the color isn’t too light, it will make them appear more vibrant. These blue tights are opaque (they are by Hot Sox and I got them at TJ Maxx.) I got the lace tights as a christmas gift, and I’ll be honest – they aren’t my kind of thing to wear on their own. Lace tights always look kind of strange to me. But layered over the brightly colored tights they make a really neat effect! We missed the big snow storm – instead we just got a bunch of rain. I hope everyone who was caught in the storm is keeping warm! I’m sick (yes, again!) 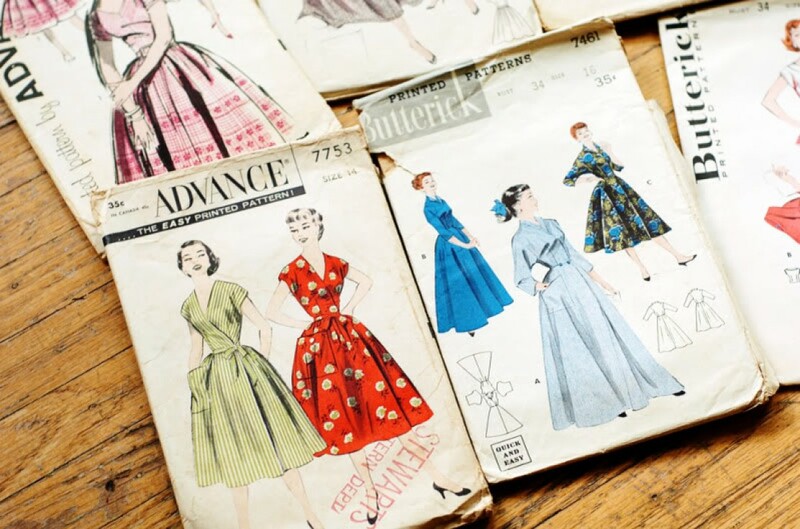 so I’m planning to spend my evening cutting out patterns for my spring wardrobe. I can’t wait to get started on it, but I don’t like to spend a lot of time in the dusty 3rd floor when I’m sick. Some DVF dress patterns can go for up to $100 (the famous wrap dress.) This one? Five dollars. Apparently I am the only one wanting to revive this moment in fashion history! The pattern calls for draped fabrics – challis, double georgette, crepe etc, or single knits. I have a ton of knits, so I might try that – either a matte jersey or an ITY. It amuses me to look at old photos and realize that pantyhose with sandals used to be totally acceptable! And, come to think of it, I haven’t owned a pair of regular pantyhose in at least 10 years – crazy! Outfit: Belts are our friends! What better way to celebrate a new year that with an outfit composed almost entirely of pieces I wouldn’t have worn a year ago? A year ago I would have said no to tunics, belts, and jeggings. I now realize that I can wear all three – it’s all in the proportions! Because I have skinny calves, jeggings and leggings look great when worn with a top long enough to totally cover my upper thighs. Belts work if I belt at the natural waist – because I have a high waist I thought I needed to belt lower for evenness – not so! I also have high hips, and belting lower just makes my legs look short, and my waist look wider. The size of belt I can wear varies with the outfit, and I find that stretch belts reduce the uncomfortable feeling. Also: glasses! This may be only the second time in 4 years that I’ve worn my glasses on the blog. I don’t typically wear them, because I have a really bad left eye, which causes my eyes to appear different sizes. But I have an eye infection right now, so no contacts for me! 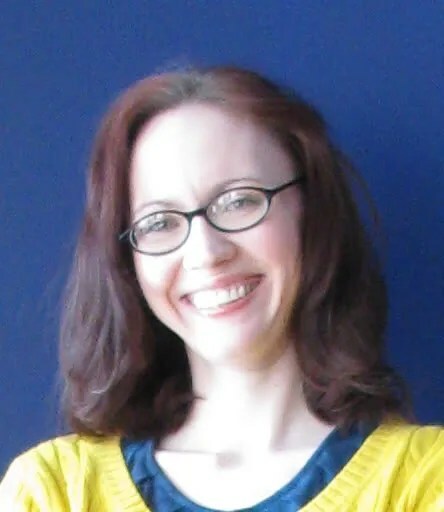 I’m thinking of getting a pair of oversized frames, now that they are back in style – those always worked better on me, and besides, when you have really bad vision the tiny frames aren’t so good – I have amazingly terrible depth perception! I kind of look like a big rectangle. I plan to make a few more tops like this from the McCall pattern and wear them in the spring and summer. We are having unseasonably warm weather (yesterday it was 62 degrees!) so I’m getting it out early! I have a backlog of December outfit posts – I take them, but then run out of time to post them on the blog! 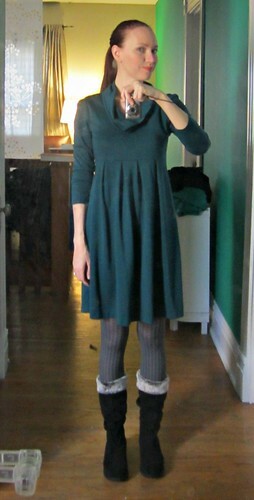 I will get to them eventually, but in the meantime here is what I actually wore today. This outfit is very me – it combines an empire waist, a fun print, and a bright color! I saw this dress at the thrift on Tuesday, and I ran for it like a mad woman (though there was no one else shopping!) I washed it, and wore it the very next day to a holiday party. This was the perfect dress to wear while consuming my own weight in pretzel bread and chardonnay (there was other food, but I like to stick to the basics, you know?) That was our last party of the season (I doubt we will be celebrating New Year’s with anyone who isn’t a cat) and I’m glad for the time to breathe a bit!